KEF R3 review | What Hi-Fi? Earlier this year, we reviewed KEF’s mighty Reference 1 standmounters. These speakers delivered a performance so complete that even that hefty £5000/$8000 price tag started to look entirely reasonable. But no matter how great value it is, such a product will always be out of the reach of most, so that’s where the new KEF R3 standmounters come in. 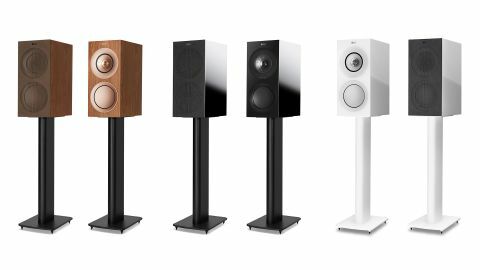 Part of the company’s recently introduced premium R series, the R3s offer a large chunk of the Reference 1’s engineering content and sonic performance at a fraction of the cost. KEF’s distinctive Uni-Q driver array is at the heart of these speakers. While it may look like a single drive unit, it is a two-way arrangement where the tweeter is positioned right in the throat of the midrange driver. This isn’t easy to do properly, but such a configuration is claimed to improve dispersion and integration. The Uni-Q array design has been continuously refined since the late 1980s and this latest generation is the 12th iteration. It uses a 25mm aluminium dome tweeter with a 12.5cm aluminium midrange unit and features a host of detail refinements to the motor assembly, suspension and drive unit structure to reduce distortion and improve performance over earlier versions. The R3s are a three-way design, with a dedicated bass driver. Such a configuration means that each driver – tweeter, midrange and bass – can be optimised to work in its specific frequency band and tuned with less compromise than a two-way alternative would demand. The trade-off tends to be the greater cost and complicity of trying to combine three drive units to work as a cohesive whole. That’s why most rival companies don’t bother at this level. The R3’s bass driver uses a 16.5cm hybrid aluminium/paper cone that aims to combine rigidity with good damping characteristics. It’s a vented design to help with dynamics at high volume levels. The bass is tuned by a rear firing port. This port uses the same sort of flexible construction as KEF’s highly successful LS50s, which the company claims reduces resonances and distortions. The KEF’s sensitivity is rated at an average 87dB and nominal impedance is claimed to be 8 ohms, though a minimum value of 3.2 ohms suggest that an amplifier with a bit of grunt would be good. We use our reference £15,000 Gamut D3i/D200i pre/power combination for much of this test – its output of 220W per channel makes the KEFs sing. The Rega Elex-R (£950, 72W per channel) is something more likely to partner the R3s and does well too. We like the speaker’s clean appearance. But even here the decisions have been made on performance grounds. The shaped trim around the Uni-Q driver doesn’t just make the front panel look balanced by echoing the size of the larger bass driver; it also helps to reduce diffraction effects at the cabinet edges. That slim front looks smart and offers advantages in rigidity and dispersion. Overall build quality is terrific. The enclosure feels immensely rigid thanks to some clever bracing techniques that combine reinforcement with damping. On the outside, these speakers look classy and are finished beautifully. All the edges are crisp and the gloss finish on our black samples is lovely. Of course, £1,300 is still a lot of money, but these speakers look worth it and more. The R3s are also available in gloss white and a more traditional walnut. Despite being relatively slim and compact boxes – the KEFs stand just 42cm high – the R3s are capable of delivering a good amount of bass weight and authority. In our test room they sound most balanced well away from all walls. We would suggest positioning them at least 70cm into the room as a good starting point. The UNI-Q array disperses the sound in a wide and consistent manner, so toe-in angle towards the listening position isn’t as critical as it is with most conventional rivals if you want pinpoint stereo imaging. We start serious listening once everything is dialled in properly, which doesn’t take long thanks to the KEF’s well-balanced presentation. We start with Debussy’s Clair De Lune and revel in the R3s’ excellent midrange clarity and ability to render the subtle dynamic nuances of the piano with delicacy. The KEFs capture the natural acoustic of the recording superbly, showing a level of insight and detail resolution way beyond most rivals. Despite all the analysis it remains a musical performer, one that focuses the listener’s attention on the message rather than the mechanics of replay. We move onto something larger scale in the form of Hans Zimmer’s Gladiator OST. Here the KEFs show the ability to generate plenty of sonic scale and authority. The R3s sound much bigger than they are, delivering an excellent stereo soundstage that is well organised, precise and nicely focused. That stereo image remains stable and convincing even when we move away from our favoured listening position. It’s here that the advantages of the Uni-Q are clear. Tonally, the presentation is balanced and natural. There’s no emphasis of any particular frequency band to make the speakers sound more interesting or exciting. That’s down to the original recording. This even-handed nature means that the speakers sound right at home across a wide range of recordings, and refuse to favour any particular musical genre above another. This is brought home when we listen to Eminem’s classic Marshall Mathers LP. It’s a thin and hard recording – something the KEFs make perfectly clear – but they make the most of the hard charging rhythms, that lovely rolling bassline on The Way I Am and that haunting Dido vocal sample on Stan. The R3’s midrange performance impresses again, delivering Eminem’s rapid outpourings with agility and clarity. There’s plenty of punch and attack when the music demands. The R3s are brilliant all-rounders. They’re expertly sonically balanced and work well across a wide range of systems, but give them a top class feed and they will deliver a sound good enough to worry most standmounters below the two grand mark. This is one to buy with confidence.